Eden Hazard has ‘no intention’ of renewing his contract with Chelsea, a move which is likely to force the Blues to sell him this summer. The 28-year-old’s contract expires at the end of next season and without a further extension in place, Chelsea will face the prospect of losing their star player on a free transfer should they not sell him during the next transfer window. 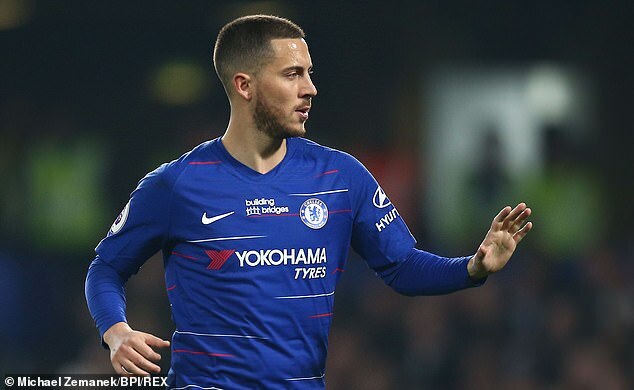 Real Madrid are the the most likely destination for the Belgium international and according to the Telegraph, Hazard may well have forced his current club to negotiate with the Spanish giants by refusing to sign any new deal. Chelsea want £100million for the Belgian, which Real Madrid are reluctant to match. However, now that Hazard has indicated he will refuse to sign new terms, the Blues will be compelled to negotiate with Zinedine Zidane’s side in order to avoid a Bosman exit this time next year. Zidane sees Hazard as potentially a 20-goal per season player and the former Lille playmaker sees this summer as his last chance to make a major move to the Bernabeu having now turned 28. Hazard has been exceptional for Chelsea in a team that has fired hot and cold throughout the campaign. He has been directly involved in 31 goals in 42 appearances for the Blues this season in all competitions – scoring 19 times. Two of those came on Monday night as he inspired Maurizio Sarri’s side to an important 2-0 victory over West Ham as the Blues seek to cement a top-four spot. Hazard’s first goal on 24 minutes was a thing of beauty as he waltzed through West Ham’s midfield and defence before firing past goalkeeper Lukasz Fabianski. His value to those at Stamford Bridge is plain to see and coach Sarri highlighted his importance to the club’s aspirations next term after the match. He said: ‘From the technical point of view, we can’t afford to lose him,’ said the Blues boss. ‘Also because it’s impossible to find another Hazard. At the moment there isn’t another Hazard, the level is so high.